Shur-Line Foam Mini Roller. These are the rollers many of our professional builders swear by for roll-and-tip painting of their boats. Quick Pro, sturdy 4-inch foam roller cover, 12 inch threaded handle, high density foam for ultra smooth finish with water or oil based enamels, varnishes & high gloss paints, excellent for panel doors, covered roller end paints corners & walls at the same time, 4 inch roller fits directly into a gallon paint. Shur-Line Foam Mini Roller Refills: 4" size For use on smooth surfaces. Small diameter core makes it easy to apply coatings. 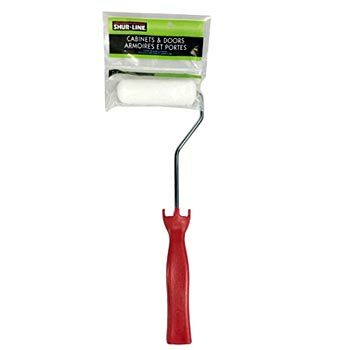 For use with paints, urethanes, adhesives, varnishes, enamels, and stains. Resealable contractor 10 pack. 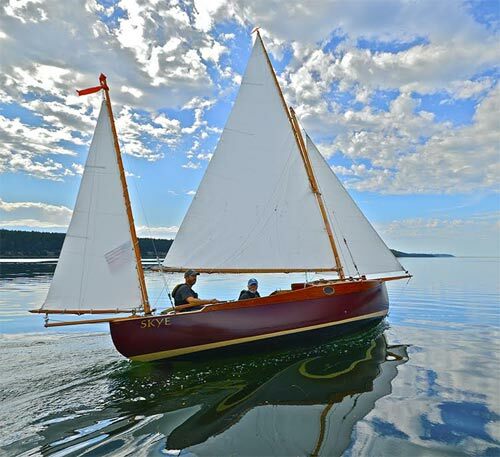 Marty Loken's Eel Canoe Yawl "Skye" was painted with our Shur-Line rollers.